In Python, how can I identify clusters of overlapping circles? In practice, the datasets I will be working with will be about this size so I'll probably never need to scale it up. But that's not to say I wouldn't favor a more optimal solution. I've come up with my own naive solution, which I'll post as an answer. But I'd be interested in seeing other solutions. What you're doing isn't really cluster analysis, it's connected component analysis. 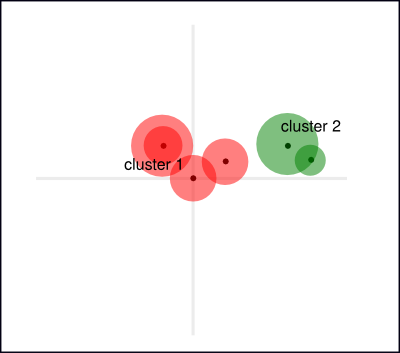 Cluster analysis would be taking a whole bunch of individual points and trying to discover the circles. But it may be of interest to you that the combination of assigning points into initial neighborhoods and clustering based reachability through overlapping neighborhoods is the heart of the DBSCAN idea and its density-based clustering variants. Create a list L of all nodes. Not the answer you're looking for? Browse other questions tagged python graphics 2d cluster-analysis or ask your own question.